Good taxation is progressive, raises necessary taxes and stimulates the economy and desired behaviours. Have the latest changes to Stamp Duty legislation achieved this? The latest release from HMRC shows a sharp decrease in the number of residential housing transactions since the changes were introduced. In the first half of 2016 before the changes 557,000 houses changed hands while in the first half of 2018 only 486,000 changed hands – a fall of 71,000 or nearly 13%. The tax raised from Stamp Duty in the first half of 2018 was £3.8bn, a fall of £539 million from the year before. Both of these statics say something has gone badly wrong – despite a growing population and a growing number of households, sales are down. The property market has slowed considerably. The consequences for the economy are so much greater – the lack of sales shows a decreased mobility of the population. Every house move has a positive multiplier effect on the economy. • Purchase carpets, furniture and white goods. It is simply staggering to imagine how many jobs would have been created if there were 70,000 more home sales? How much tax has been lost as a result? The lack of mobility also hampers job mobility. Analysing the data in further detail, shows the average Stamp Duty per transaction in H1 2018 was 8% lower than H1 2017 at £7,893. As the bulk of the stamp duty is generated from the sale of expensive properties, it shows that the increase in Stamp Duty has caused a sharp reduction in either the sale price and/or the volume in more expensive properties. There are other factors such as Brexit but these were equally relevant a year ago. The fact is that house sales have slowed considerably, and the trend is worrying. Any tax loss is irreversible – it is lost permanently. • People are not buying without price reductions. The transaction cost is too high. • Lower prices are affecting the entire market – potential sellers are reluctant to place their homes on the market. • A bigger portion of sales are of distressed property – due to death, divorce and debt. Reduced values cascade through the system. • People are reluctant to downsize as the equity release is lower. It is not a total failure – the changes for first time buyers and the lower rates for lower value properties are to be applauded as small steps in the right direction to increase owner occupation and mobility and can be recognised as a real success. To conclude the changes to the Stamp Duty regime have failed – it is costing jobs, it is reducing taxes, it is reducing mobility. 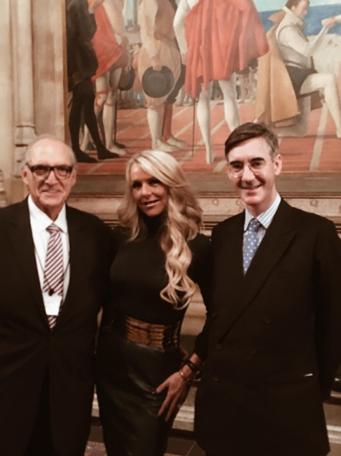 Jacob Rees Mogg MP together with Campaign for Fair Finance Founder and Chairman and founder of fairmoney.com Dr Roger Gewolb at the House of Commons with Celia Sawyer, who has also been active raising the issues on Stamp Duty.